I recently completed a project where I had to come up with a process for quickly grouping people into different units. The client was an NGO, and I assisted an internal working group in developing a new organizational model for the head office. This NGO carries out long term development and emergency assistance, and the head office comprises experts in various fields (e.g., logistics, water supply and sanitation) as well as so-called program coordinators who support development projects in Africa, Asia, and Latin America. Two alternative organizational models had already been developed before I became involved. 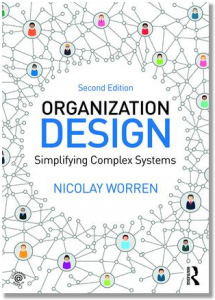 Yet the challenge was that the two models had only been described at a high conceptual level, which led to a lot of questions from managers and employee representatives, who could not understand how the new models would work. In addition, there were also several open issues that had not been closed. For example, the models left open the question of how to organize one of the key teams – the emergency preparedness team (which assists country representations when there is a disaster): Should it remain as a team or should the people in this team be transferred to other units? 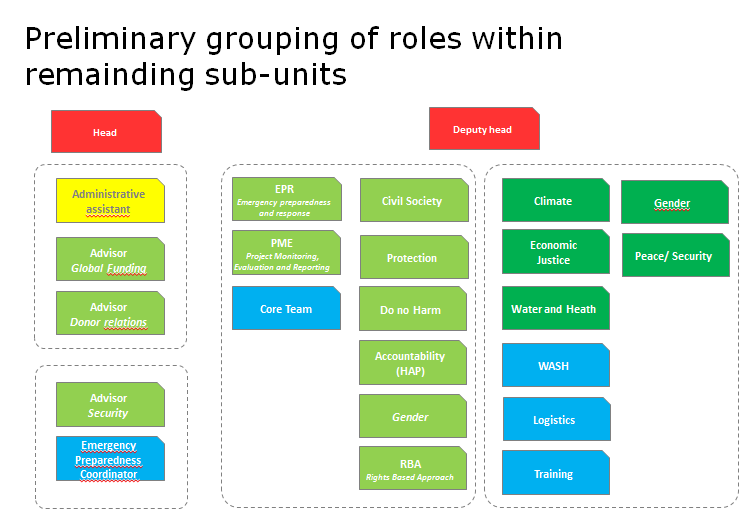 We used different colors for different categories of roles, for example, we used red for line managers and two shades of green for two types of subject matter specialists, and blue for the roles within the NGO’s emergency preparedness team. 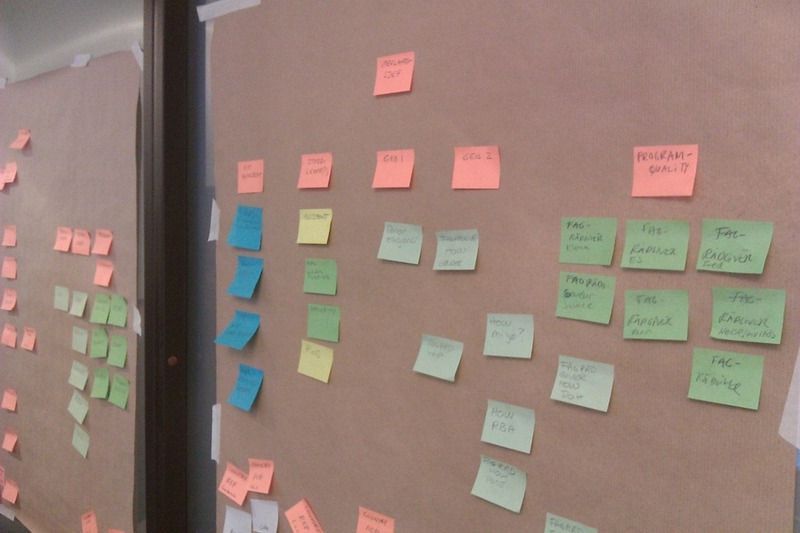 We placed the notes on the board to indicate how the team groupings in the two alternative organizational models would look. 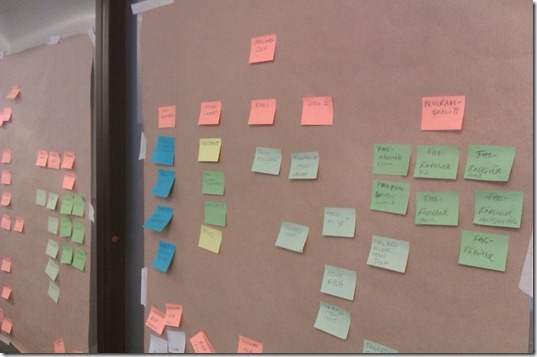 I took the picture shown above with my phone camera during the session, and it shows one organizational model mapped on the left board and another on the right board. Once we had mapped the two alternatives, we started playing with various modifications that we thought could improve the overall design further. Both the client and I were surprised by the speed at which we are able to come up with new ideas using the method. 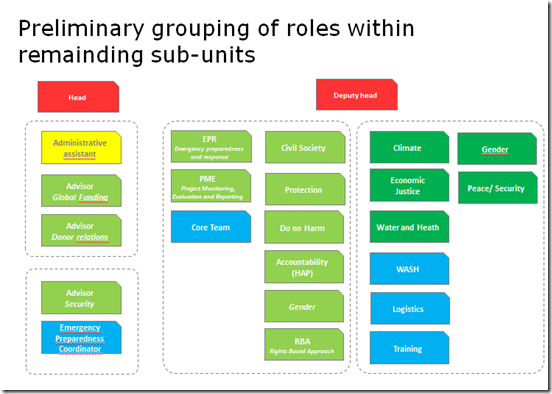 When the proposal was presented later by means of a Power Point presentation, we chose to keep the same color scheme as we felt that it helped us communicate how the different categories of roles would be grouped in the new model (see example below). It forces you to do a “reality test” of conceptual models that may only have been presented (and understood) at a high level. Rather than talking about how great it would be to have a “process based” or “geographical” or “customer oriented” organizational model, you specify the details of the model and also get a sense of how easy or difficult it would be to implement it (the color coding is important as it makes the key changes implied by the model obvious, such as the distribution of the “blue” team shown above). Working together using the wall creates a better group dynamic compared to the endless point-counterpoint discussions that tend to ensue when seated around a table and listening to someone’s presentation. Instead of discussing, we design something together! In fact, if you first do a session with Post-it notes and then go to your desk to draw some illustrations using PowerPoint, if feels like walking in a bed of glue in comparison. Instead of using a few milliseconds to stick a note to the wall, it now takes several minutes to draw and align a box properly, adjust the fonts and formatting etc., and that may add up to several hours (or days) before a complete presentation is done. Nonetheless, it is also important to document ideas and solutions electronically so that they can be stored, distributed and communicated. So I am afraid we need to keep PowerPoint in our tool box until something better comes along. I should add that although the sticky note approach encourages improvisation, it needs to be well planned and well timed. It is no use starting to restructure units in this manner unless you have basic information about how the organization works or what the goals of the exercise are. In my experience, a session like this is most useful somewhere in the middle of a design process, at the stage where the goals are relatively clear and when you have started to formulate preliminary ideas for new design solutions.